Are you looking to purchase a midsize sedan? If you are, we recommend the 2018 Ford Fusion. 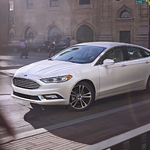 The 2018 Fusion comes packed with smart features that make it a top choice with consumers. Read further to learn more about the 2018 Ford Fusion smart features. The 2018 Fusion offers inflatable rear safety belts. The Fusion is the first model in its class to offer this feature. It helps keep passengers safe by keeping them secure and distributing force evenly during a collision. The 2018 model also comes with a Blind Spot Information System (BLIS). This system uses radar sensors to constantly monitor you blind spot zones for optimal safety. Are you ready to take the 2018 Ford Fusion for a test run? If so, be sure to stop by Mojave Auto Group to see all that it has to offer.